Next course is scheduled for April 2019. This course is a time and labor intensive experience on the part of the student expert. The Alabama Chapter is certified to present the International Assocation of Arson Investigators' EXPERT WITNESS COURTROOM TESTIMONY COURSE. With three certified instructors, the Alabama Chapter has several courses since Chapter certification in 2006. With an instructor to student ratio minimum of 1:1 and many times 3:1, respectively, the quality of the instruction and knowledge gained is unsurpassed. It provides the student with a "real world" testimony experience through classroom instruction, one on one counseling and preparation, then performance "under fire". Anyone considering or involved in forensic investigative work should go through this course at the beginning of their career. It provides an absolutely clear demonstration of each of the points and concepts explained in many investigative texts and literature, including NFPA 921 and 1033, Kirk's Fire Investigation, Forensic Fire Scene Reconstruction and others. Each student has a very clear understanding of the importance of why you would use the scientific method, why the accuracy and authenticity of your work is critical and how to present the information, evidence or data from your investigation. Next one is scheduled for April 2019. 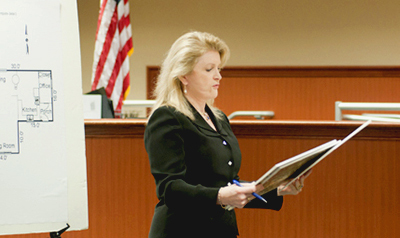 Mrs. Sue Williamson (above) is a very experienced Fire Litigation Attorney who volunteers to help with the course. This is a very time intensive course for the student expert and the instructors. It invokes a "real world" courtroom testimony experience.